This title was first published in 2001: Exploring the relationship between the recession and labour supply in Kazakhstan during the 1990s, this volume develops an innovative new model of the transitional process in the context of the CIS. 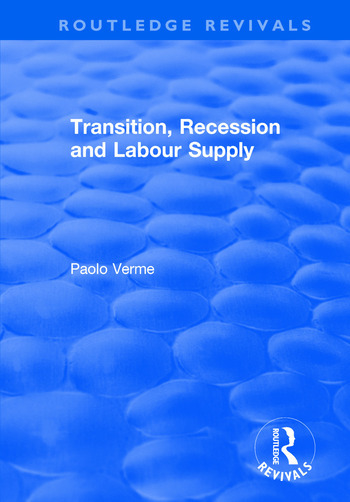 It departs from conventional economic models explaining the process of transition, transferring the focus of attention from labour demand to labour supply with a view to clarifying how the transitional recession has affected households and, in turn, how these changes modified the supply of labour. Paolo Verme examines how the dynamic of the reallocation of labour between state and private enterprises has been drastically altered by the growth of self-employment and also takes a much-needed look at the contribution of other factors, offering an original explanation of this most important economic phenomenon. Contents: Explaining the L-Shaped Transition: Transition, output and labour in CIS and CEE economies; Towards a model of the L-shaped transition. Kazakhstan: Transitional reforms and recessional dynamics; The reallocation of labour; Labour supply. Labour and Development: Labour market policies and the future of labour; Conclusion; Appendix; Bibliography.